The Nemesis Quattro combines surpeme energy efficiency with the power to get the job done. The unique Quantum T5 lamps provide more output in a slimmer design so large industrial areas are no problem. 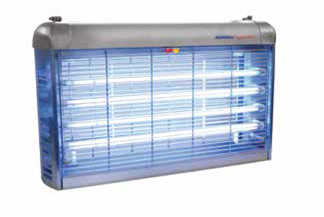 The Nemesis Quattro features energy efficient PestWest Quantum T5 14-watt UVA lamps powered by a state-of-the-art electronic ballast for flying insect management and very low operating costs. •ROHS compliant T5 tubes have a higher UVA output with less electricity consumed and 40% in energy savings compared to conventional lamps. Shatter resistant Quantum lamps for lead-free, low mercury (Hg) and glass-free zones .